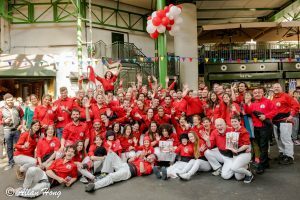 Castellers of London (CoL) is made up of over 90 members with more than 9 different nationalities and languages. CoL is run entirely by its members and has two governing bodies: the Management Committee and the Technical Team, which are managed by volunteers devoting their own time to keep the colla working every day. The Management Committee is in charge of organising the rehearsals and performances and making sure that the group is able to perform its activities. The Technical Team is in charge of deciding which structures to build and setting the upcoming targets for the colla.